The second picture in the gallery shows us approaching the cove from the east. 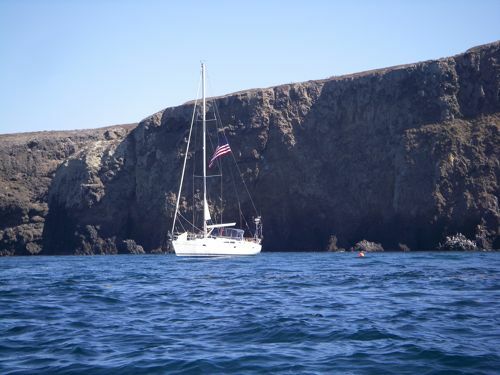 That’s pretty typical for a run from Channel Islands Harbor. There are no hazards to navigation until you get in quite close. We used to anchor seaward of the 40′ rock (top left above), but unless the wind is slightly south, you won’t be in the lee. Rather than pinch in, I’ve been anchoring a bit farther out in 40 feet or more. I have also seen boats anchored east of the rocks with a stern anchor 75 feet off the beach and bow anchor abeam of the 40 foot rock. It would be fairly tricky to maneuver our boat in there and the boat that we saw in there was pitching three or four feet. 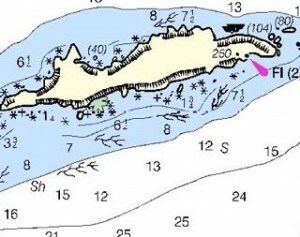 When the wind is calm or from the east, it is often more convenient to anchor just west of the point. Stand off a hundred yards or so to avoid submerged rocks near datum and to keep clear of kelp. It’s OK to observe the sea lions, but if they startle, you’re too close. 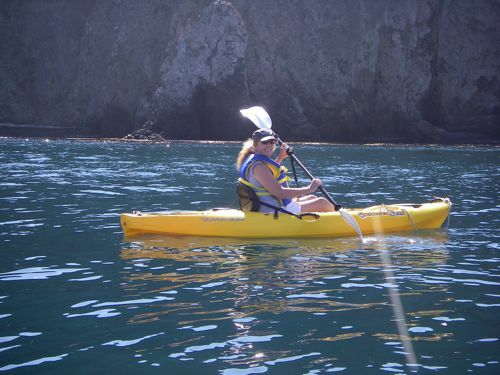 On nice days, Anacapa is a fine place for kayaking with more than 100 caves perforating the island’s coast. Cathedral Cove has several caves and a high-ceilinged, very long tunnel that makes for a pretty spectacular paddle. Particularly in smaller caves, beware of tide and swell. 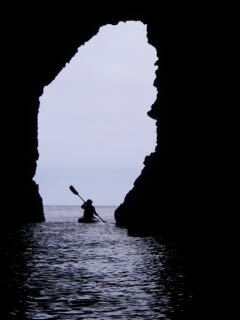 Prudent kayakers don’t enter caves if the tide is high or if there is more than a tiny swell. A helmet is always a good idea. It won’t keep you from getting crushed on the ceiling if a swell rolls in, but it will save you from falling rocks. I’m pretty well convinced that the critters that live in the dark caves don’t want us in there and intentionally bomb us. 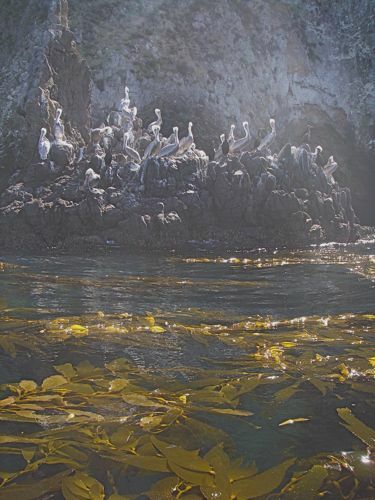 Dense kelp forests are close to shore and tide pools hold the usual denizens. 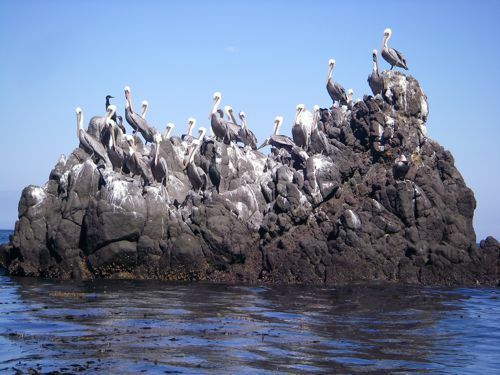 Brown Pelicans are in abundance as are cormorants, oyster catchers, western gulls and other species. 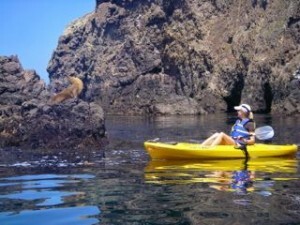 You’ll also find sea lions and harbor seals in the small coves and perched on rocks. Keep clear of all of these critters by at least 30 meters. 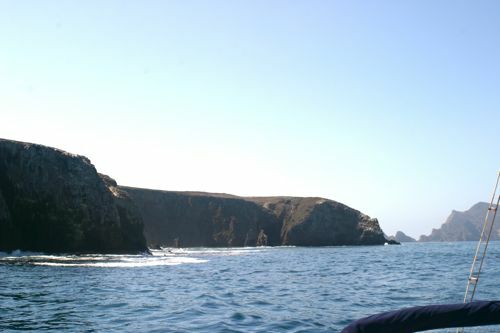 A permit is not required to land or hike on East Anacapa Island. The landing dock, which is at the east about half a mile, is available for unloading purposes only. No craft, including kayaks and inflatables, should be left moored to the dock. 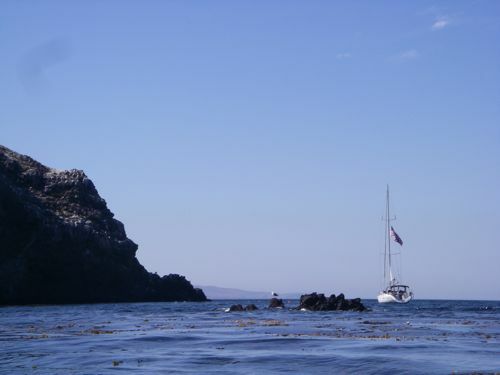 Dive boats are frequent visitors here, usually anchoring bow and stern on the east side of the cove. The divers mostly stay in and near the kelp forest in that area. Though you may be under sail, do not expect the dive boats to give way. Be judicious. It's OK to observe the sea lions, but if they startle, you're too close.